The Fall 2014 print issue of Susquehanna Life provides an insight into the efforts being made to strengthen our region as well as great things to do outside, ways to stay healthy, and generally enjoy where we live. Did you miss the print issue? You can order back issues or subscribe to the magazine to never miss another issue of Susquehanna Life again. 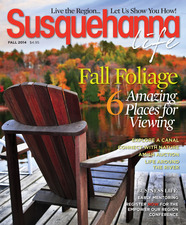 Would you like to order a back issue of this edition of Susquehanna Life? Enter the name of the issue below and click "Buy Now"